Prevention is better than cure: this wise old proverb is perfectly applicable to fishkeeping. Prevention entails daily observation of your fish and their environment, and this requires a certain degree of knowledge. In the end, the best prevention comes from maintaining a good balance in the aquarium. Generally speaking, there are two types of diseases - infectious and non-infectious. The former are caused by microorganisms, such as bacteria, fungi, or viruses carried by the fish. The triggering factors are well-known: stress, bad diet, decrease in temperature. Some pathogenic organisms have a mixed life cycle: one part on the fish, one part in the water. Non-infectious diseases are not caused by pathogenic organisms, but by the environment (low-quality water, underfeeding). It is important to avoid any cocktails of medicines and useless or harmful overdoses. The treatment schedule must always be respected, even if the symptoms quickly disappear. 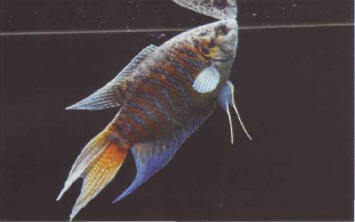 When taking care of sick fish, it is best to feed them moderately, but with natural foodstuffs. Once the illness is cured, provide a varied and well-balanced diet, in order to consolidate the healing process. HOW TO RECOGNIZE A SICK FISH? Diseases are not particularly easy to detect, especially if they do not manifest any external symptoms. However, several indications can lead an aquarist to think that a fish is sick. These phenomena can be seen in isolation or together. The bearing of this fish (Macropodus opercularis) and its siightiy raised scales suggest a poor state of health. 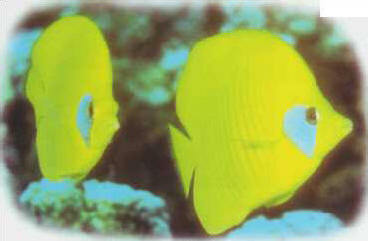 General behavior: the fish hides, is easily scared, and is stressed out. Swimming: uncoordinated, and the fish may scrape against the decor or the bed. Feeding: weight loss, refusal of food. Breathing: the fish comes to the surface to "stock up" on air. External symptoms: white spots, whitish marks, swelling of one or both eyes or the whole body, bristling scales, several wounds, etc. AND A FISH IN GOOD HEALTH? There are two things to take into consideration: the fish's appearance and its behavior. This requires a good knowledge of its anatomy, biology, and ecology. A fish in good health has bright colors and sparkling eyes. Its body is not swollen and its scales and opercula do not stick out. It comes to eat in a normal way, in terms of both the feeding process itself and the amount it eats. It does not hide without a good reason. Bright colors and fully deployed fins are signs of good health. Put the fish in a hospital aquarium. Raise the temperature to 27-28 °C. Stop the filtration, and maybe the protein skimmer in salt water, while at the same time increasing the aeration. Dilute the medicine as required. Pour the medicine little by little into the aquarium. It is best to spread this operation out over a period of at least one hour, or one day when administering copper sulfate. Leave it to act for the recommended period. Empty out half the aquarium, then top up by adding water that is identical to the original. Change 10% of the volume each day for 5 days, always using an identical water. Repeat the treatment if necessary, following the steps above. Switch the filter on again and, where applicable, the protein skimmer. Gradually reduce the temperature to its original level. This operation must be spread over 3 days. Bring the aeration to its original level. In a mixed aquarium, the process obviously begins at point 2. Knowing your fish well - their color and behavior - constitutes one of the main rules for disease prevention in an aquarium. ЮЖНО-КИТАЙСКАЯ ПЛАТФОРМА , докембрийская платформа, занимающая бассейн нижнего течения р. Янцзы. В антеклизах сохранился чехол палеозойских отложений. В мезозое испытала сильную тектоно-магматическую активизацию.